With a few tweaks, Dinner Elf can be affordable for tight budgets. Limit your favorites to the least expensive items on the menu. 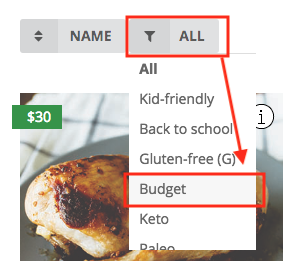 In your favorites, update your filter to "Budget." Click "I only want budget". Now your favorites will be limited to family-size mains for $30 and sides for $10. TIP For variety, add a few casseroles. They're more expensive, but their portion sizes are huge. Click "Removed", filter for "Casseroles", then add some or click "Add all casseroles." 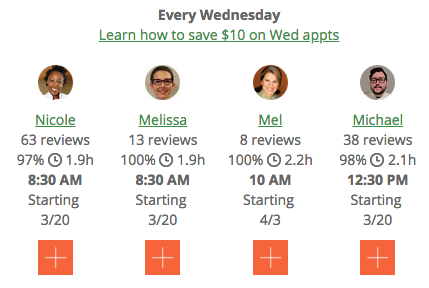 When your dinner is on autopilot, you save $5-$10 every appointment. You can still cancel by 5 pm three days prior with no fee. Go to your autopilot page. Select a spot on Wed-Sat to save $10 every appointment (other days you save $5). To minimize your monthly costs, you can schedule every other week. Always select family-size dinners. They're twice the size of 2-person size dinners for only $20 more. Even if you're not feeding a family, freeze extra food for leftovers. Under appointment details, set your default order size to "Family". Post your referral code on NextDoor and a local Facebook group. When new customers use your code, you'll get reward points that result in free food. Even if you don't have kids, add our free peanut butter sandwiches to your order to supplement meals. To make your dinners go farther, pick complicated mains and sides that can stretch into other meals. Then supplement with the easy stuff. Read this guest blog post.